For the past couple of decades, technological developments have caused the way in which we work to continuously evolve, particularly by changing the ease with which we can bridge physical and temporal distances. Combined with rising competitive pressures and changing employee expectations, this has led to a substantial uptake of flexible working practices. Most notable among these is telework. 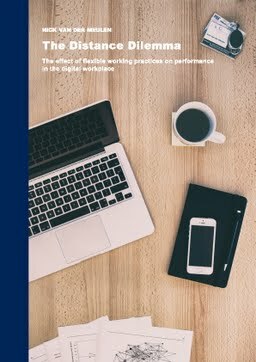 Whether telework actually works, however, still remains to be seen: existing studies on its relation with performance are limited, typically lacking both an indication of how frequently employees telework as well as a solid theoretical foundation that could help elucidate its underlying causal structure. These shortcomings are an important motivation behind the research presented in this dissertation, which focuses on creating a better understanding of how the extent of telework (through enacted temporal and spatial flexibility) affects employee and organizational performance. This was done by applying multiple theoretical perspectives, levels of analysis, and analytical methods in four empirical studies, each of which addresses specific distance dilemmas inherent in telework. Overall, the findings, perspectives, and frameworks presented in this dissertation offer important insights into how to maximize employee and organizational performance in a telework context, and contribute a springboard for additional investigations in this area. Does remote working really work?